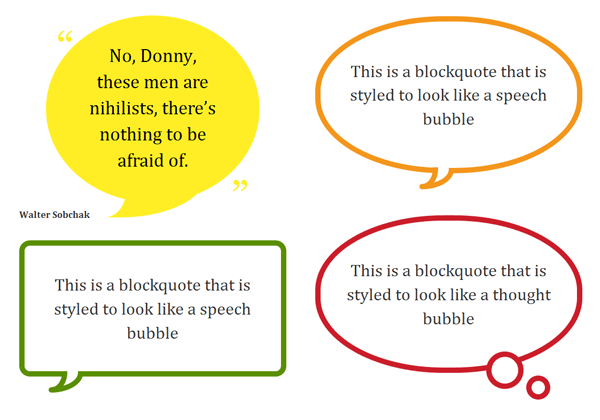 In this short presentational cheat sheet, Nicholas Gallagher has shared a wonderful no Javacript, no image, purely CSS/CSS3 solution to style text in various shapes of speech bubbles. The page offers a ready to use CSS stylesheet which one can download and use in their webpages with very little modifications. These are also highly documented and easy to understand should one want to know how to such shapes and more, for themselves. Nicholas Gallagher is a Web Designer and as per his about page on the blog, currently works with Twitter. He is often credited with improving theBEM model of CSS class notations. The CSS file used in the demo page is heavily commented so that you can see which lines of code are responsible for each part of the effects. Support: Firefox 3.5+, Safari 4+, Chrome 4+, Opera 10+, IE8+. I’d encourage you to adapt the examples to your needs and use any other associated elements available to you in your existing HTML document. 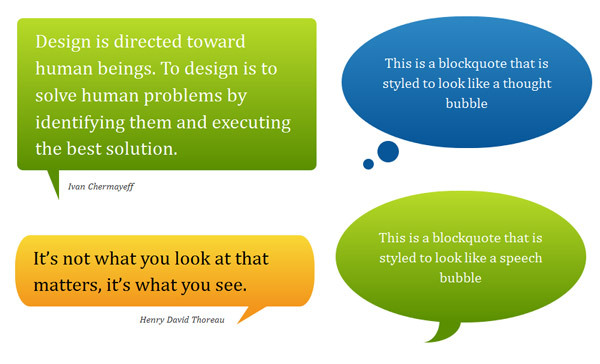 The key is to use the :before and/or :after pseudo-elements to produce basic shapes. By applying CSS3 properties such as border-radius and transform you can produce more complex shapes and orientations. This is how the heart-shape in my CSS typography experiment was created. This is an example of how to create a basic speech bubble with a few enhancements. For further examples see the demo page and the heavily commented CSS file that it uses. This approach is one of progressive enhancement. Styles are built up in layers from simple coloured boxes, to boxes with a “speech tick” of some kind, to rounded rectangles or circles with gradient backgrounds. Browsers render the styles that they are capable of rendering. Firefox 3.0 supports the necessary CSS 2.1 pseudo-elements but does not support the positioning of generated content. Some of the examples are close to what I consider to be unacceptably broken in Firefox 3.0. It is the only browser above 2% market share — currently at ~4% as of March 2010 according to NetApplications — that cannot handle even the basic speech bubble effects. Before applying this technique, consider the importance of Firefox 3.0 support and the percentage of your visitors currently using this browser. Eventually it will become a rare browser but due to it’s partial CSS 2.1 support you should be aware that there is no graceful fallback for Firefox 3.0 when using this technique.